The Magic Spells slot machine game is the second game that Win A Day casino launched so far in 2017. They kicked off the new year with the Robot Escape slot machine and now are following up with another spellbinding slot game. The Magic Spells is a great addition to the Win A Day casinos penny slots. As you spin the reels playing the Magic Spells online slots real money you will allow the witches to wave their wands and help you spin for a better position and better winning combination. This game has enchanting 3D graphics and is unique and one of a kind. 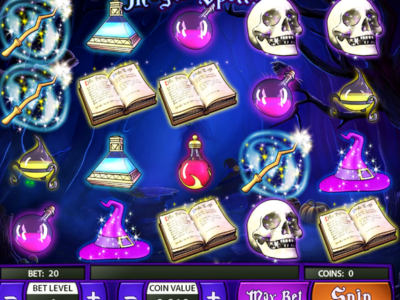 The Magic Spells online video slots have a Witchcraft and Wizard theme and come with a progressive jackpot. It features five reels with four rows and 20 pay lines to make a profit from at any time during the game. This game has a low betting range, so it is ideal for penny slot machine players that are looking to bet less than a penny with a shot at some magical real money wins. You can bet anywhere from $0.01 up to $0.05 per pay line, but all of the pay lines have to be active to win the progressive jackpot. In total there are five betting levels so choose how much you want to wager and click spin or the auto play button. 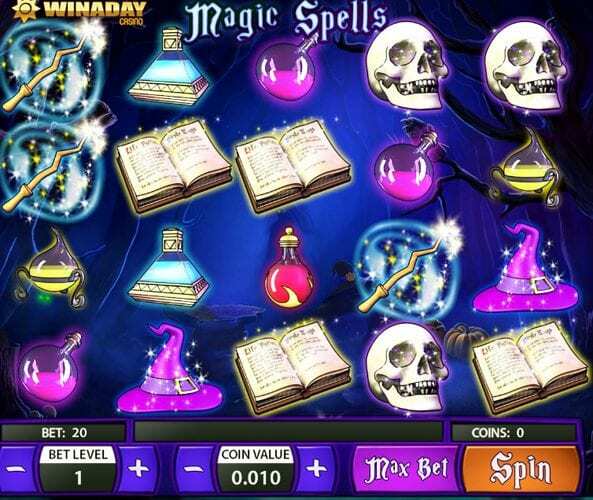 Once you click turn or the auto play button for the Magic Spells online slot machine game for real money at WInADay casino, you will see important symbols that are indicative of its theme. You will see the skulls, wands, hats, and all of the options in motion as icons in the game. There is also a Magic Spells Bonus Feature plus another single bonus round that adds, even more, magic. The expanding wild symbol may appear on the reels at any time during the slot machine. Once you land the expanding wild symbol, it will substitute for any of the other icons on the reels and help you put together a winning combination. The expanding wild symbol can expand across the entire wheel to enhance your real money wins across the pay lines. When you play the Magic Spells online slot machine game for real money at Win A Day casino, you will have the chance to land 3 or more of the Pick Bonus symbols on the slots. Enjoy the opportunity to choose from anyone of them. Each of the 3 Pick bonus symbols represents a particular prize. Make sure that you are careful with your selection so you can maximize your cash prizes! As you enjoy playing the Magic Spells online slots for real money at WInADay casino, you can win great prizes almost magically by betting few bucks.